Rachel (Ginnifer Goodwin) had been in love with Dex (Colin Egglesfield) ever since they met in law school. Rachel, recently turned thirty, successful in her career but still the same insecure girl she once was, was broken up about the fact that her best friend since childhood, Darcy (Kate Hudson), was about to be married to Dex. While on the way home from her birthday celebration, Dex leaned in to kiss Rachel. It turned out he wanted her all along. “Something Borrowed,” directed by Luke Greenfield, offered thinly established and ultimately annoying characters so following them, especially Rachel, in their journey to self-realizations was like pulling teeth. A lot of teeth. The screenplay by Jennie Snyder was a mess. While the material was based on Emily Giffin’s novel, the film would have benefited greatly if Snyder took ahold of her creative freedom and altered the circumstances that surrounded the characters. Since what was at stake seemed incredibly shallow, especially for adults thriving in the city, the movie could have ended in less than twenty minutes. Rachel and Darcy were supposed to be BFFs since they were kids. Yet I found it difficult to believe that Rachel couldn’t pull Darcy aside and say, “Hey, you know the man you’re about to marry? I’ve been in love with him since forever. Just thought you should know before you walk down the aisle.” (They really did talk like that.) I understood that Rachel valued her friendship with Darcy and she was afraid that if she admitted her feelings, the friendship could come to an end. But if she really cared about herself and her friendship with Darcy, she would summon up the courage and just be honest. Darcy would have a right to be upset, maybe even for months. But if she was really the best friend Rachel considered her to be, she would eventually come back. Faith is an important component of friendship and I wasn’t convinced that the filmmakers invested enough time and energy to drive that point across. As a result, Darcy and Rachel’s friendship felt shallow, reduced to moments like the two of them admitting that they were glad they had known each other for so long. Knowing somebody for a long time does not equate to a meaningful relationship. Speaking of meaningful relationships, Ethan (John Krasinski), Rachel’s best guy friend, deserved to have more screen time. Krasinski playing his usual sardonic character worked because I shared the same feelings he did about Rachel’s groan-worthy soap opera of a life. He was the voice of reason. 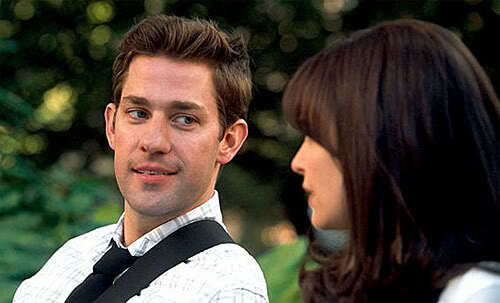 Further, Krasinski would enter a scene and I immediately thought he was funny even if he didn’t say a word. That’s more than I can say about Goodwin and Hudson. I couldn’t believe they actually engaged on a dance-off to make us laugh. It wasn’t as funny as much as it was sad. Early humans primarily used body movements to communicate. These modern gals weren’t any different.